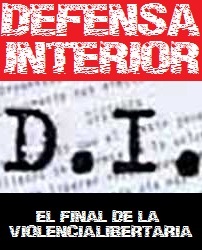 Defensa Interior (DI) was a clandestine anarchist organisation, founded in September 1961 by the congress of the Movimiento Libertario Español (Spanish Libertarian Movement: CNT, FAI, FIJL, Mujeres Libres) and disbanded by their 1965 congress. The objective of the DI was to revitalise and co-ordinate international resistance against the Francoist State, and to organise the assassination of General Franco. It quickly became clear, however, that it was, primarily, the new generation of young libertarians (FIJL) who demonstrated the political will to relaunch the armed struggle against Franco, a strategy that in reality had long since been abandoned — and actively sabotaged! — by the Toulouse-based leadership of the CNT-FAI (principally Federica Montseny, Germinal Esgleas and Vicente Llansola. My personal preferred explanation [i.e. SC] for Esgleas’ and Montseny’s behaviour — which is outlined in Pistoleros 3 — is that they had been seriously compromised by their collaboration with the Gestapo during the Occupation, which explains why they were never handed over to Franco, as occurred with most other prominent Spanish Republican exiles. After the war the Gestapo’s archives fell into the hands of the Soviets, which would have provided the Communists with leverage over the CNT/MLE in exile, thus ensuring the CNT’s passivity and allowing the PCE free rein as the principal opposition to the Franco regime. The Gestapo’s information was also more than likely available to the Spanish police and security services). It was to be the last time the CNT, the Spanish anarcho-syndicalist labour union in exile, created a defence structure and funded the formation of action/defence groups.